I just read the inside of my Snapple lid and was treated to Real Fact #123: Beavers were once the size of bears. I instantly felt that I should not be allowed to know this about beavers. This knowledge will make me act crazy. Last week I was typing in my parents' basement office which was recently redone with a new super-shaggy carpet. I saw something in my peripheral vision and glanced over to see a large cockroach painstakingly climbing up and down the hillocks of fiber. He wasn't getting anywhere but he was trying very hard and so my heart went out to him at the same time that I wanted to smash his guts in. I watched him for a minute to be sure that he was truly slow and incapable of pulling any fast ones like actual scurrying. Then I got the bright idea to take him outside. Since he'd only progressed an inch in five minutes I thought maybe he'd stand patiently on a manila folder while I carried him up the steps and out the door. When I slid the folder under his belly, however, he did a back flip back down to the carpet. I jumped and ran back to my desk. The cockroach froze in place and I imagined he was thinking: She won't notice me if I JUST DON'T MOVE. The cockroach was most likely looking at me out of the corner of his eye, too, but of course I couldn't tell. "Just don't walk towards me!" I said, pointing my index finger at him. And he took a left. In my direction. So I went over, put a pillow on top of him, and smashed his guts in with my heel. When I tried to resume writing I couldn't ignore the nagging suspicion that there was a huge, beagle-sized cockroach curled up on the floor at my feet. Or tapping my leg with his antennae. Or blinking a giant cockroach eye and waiting to make eye contact with me before avenging my mercenary act. I sat cross-legged in the chair and shook my head several times quickly and ordered myself NOT TO GO DOWN THE ROAD I WAS ABOUT TO GO DOWN. It is a road that I explored as a child after catching part of "Earth Vs. The Spider" on television. The plot of this campy 1958 movie centers around a giant spider that lives in a cave and is discovered by a couple of teenagers who barely escape with their lives. I remember a girl shrieking and trying in vain to push a boulder towards a elephantine tarantula who keeps stretching its mutant legs out towards her. Needless to say, I lost some sleep over this scene. The spider was at my bedroom door, opening the knob with its huge hairy leg, checking me out with eight gigantic eyes, crawling towards my bed to eat me, etc. 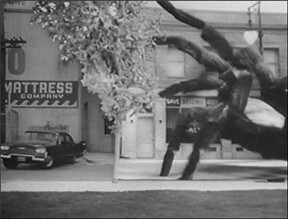 Now I recall the squirmy panic inspired by giant movie spiders and the fact that last week I wouldn't pick up the cockroach pillow for a whole day out of fear that a jumbo retaliation cockroach who was already mad at me was waiting underneath. Hopefully beavers are cute enough rodents that the idea of a bear-sized version who hasn't shuffled around for 10,000 years won't keep me up tonight. Just imagine - if while plotting revenge for Backflipping Cockroach's untimely squishing Giant Cockroach discovers not hate, but an amazing love for you. Anything is possible, right? Makes you think about the little tickle on your cheek that wakes you up at night. Eww. I think N would enjoy a tour of the Jack Daniels Distillery in Tennessee. hey if a towel dispenser can fall for me I don't see why a cockroach couldn't. as for Jack Daniels, as much as I'd like to be a good influence on N, I think that would be REALLY FUN. let's plan a trip.